Allison Sayer first came to Alaska from the East Coast in 1999 for an internship at a remote nature center. She was completely hooked on Alaska’s phenomenal beauty, wide open spaces, and generous people. Over the following twenty years, she traveled all over the state working as a biologist, a commercial fisherman, a wilderness guide, an outdoor educator, and a writer (among other things). 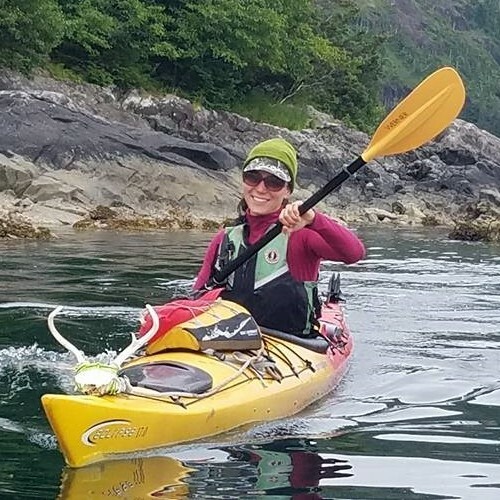 She has had the opportunity to guide kayak trips throughout Prince William Sound and the Tongass National Forest. Allison’s love of Alaska has only deepened with time, and she continues to enjoy delving deeper into the many secret joys the Alaska wilderness has to share. She has also made a home in a small off-grid community in the Chugach Mountains north of Valdez. Allison holds a Master’s Degree in Biology from the University of Alaska Anchorage as well as Swiftwater and WFR certs.